Perhaps the best way to differentiate two often-confused terms ‘“ charity and justice ‘“ is to re-tell the parable revolving around these two concepts: There was a village holding a social gathering one summer, when a person noticed a baby struggling and crying in the river. As someone rushed to save the baby, more babies were added, so the people tried saving the children. As others became busy with their rescue efforts, two people went upstream to stop whoever is throwing the babies into the river. This may seem to be an improbable tale, but the difference between the concepts of justice and charity are clearly outlined. Charity occurred when the townspeople put their efforts together to rescue the babies, while justice was seeked by the two individuals who went upstream to stop whoever was throwing the babies downstream. As such, justice refers more to the concept of moral rightness, while charity refers more to the giving of help to those who are in need. Charity deals with the immediate need, while justice leans more towards addressing the root cause of the problem. In a federal government, for example, charity is shown when a non-governmental organization puts together a soup kitchen to feed the homeless, or put up shelters for those who are in need. On the other hand, justice veers more towards a non-governmental organization, who will call and write to the elected officials, and demand laws that will lead to systemic change ‘“ so that problems like hunger and poverty will be resolved on a bigger scale. Although both charity and justice aims to fulfil a need, the approach is different. Charity addresses the immediate need, while justice digs a bit deeper into the root cause of the problem. 1. Charity is the giving of help to those who are in need, while justice is the system which oversees that the concept of moral rightness is applied to a situation when someone has become the aggrieved party. 2. Charity addresses an immediate need, while justice gets to the root of the problem. 3. Charity offers a direct service to those in need, while justice focuses more on social change. 4. Charity can be practiced by individuals, governmental and non-profit organizations, while justice is served by the federal courts. Mabelle. "Difference Between Justice and Charity." DifferenceBetween.net. 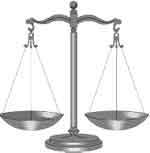 January 28, 2010 < http://www.differencebetween.net/language/difference-between-justice-and-charity/ >. The works of mercy are charitable actions by which we come to the aid of our neighbor in his spiritual and bodily necessities. Instructing, advising, consoling, comforting are spiritual works of mercy, as are forgiving and bearing wrongs patiently (modern day equivalent for the non religious = tolerance). The corporal works of mercy consist especially in feeding the hungry, sheltering the homeless, clothing the naked, visiting the sick and imprisoned, and burying the dead. Among all these, giving alms to the poor is one of the chief witnesses to fraternal charity: it is also a work of justice pleasing to God”when we administer necessaries of any kind to the indigent, we do not bestow our own, but render them what is theirs”; we rather pay a debt of justice and accomplish a work of Charity…. To not offer an alms when one is able is a sin or “crime” against justice. When we give to the poor what they need to live we are not giving them what is ours, we are giving them what theirs. This is the very definition of justice, namely to to provide what is due to another. [What is this? That which is strictly necessary for life] Is not every human person – barring some extreme circumstance – due the necessities of life? We can add (for the religious minded) What God desired for them to have in the first place is what is owed in justice. And who can deny that? Do we believe that God did not want them to have what is necessary for life? Of course not. If we have what is necessary to provide essentials lacking in the life of another, and we only offer a pittance [A very small or inadequate amount of money paid to someone as an allowance or wage. (Merriam Webster)], we not only do not perform a work of Charity, but we commit a “crime” against justice.